Built on a coherent network of 5 major railway corridors coming in from the region surrounding Amsterdam onto the Amsterdam Railway Ring, where intermodal transfer nodes provide for an interchange with trunklines of regional bus and transfer with urban tramlines into the city neighbourhoods. The urban transport system furthermore consists of 4 metro lines connecting Amsterdam quarters with each other and with the central city. 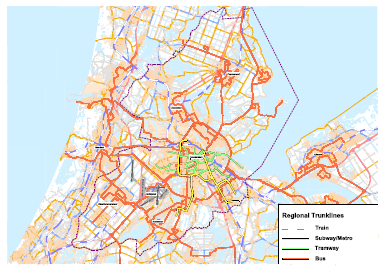 In 2006 the Stadsregio has awarded GVB a concession for the major bus and tram trunklines in the Amsterdam city whilst cutting back on quantities on some periferic bus- and tramlines in the city. Thus the aim is to create a more efficient and sustainable network and to provide better services for the passengers. Stadsregio is preparing to the adjustment of the urban metronetwork in 2018, when the North-South metroline (now under construction) is expected to start, connecting the north part of the city with the central city area and the South business center. Due to cutbacks of the central government on subventions for public transport by 2012 the region is getting ready for a grand revision based on a more cost-efficient. This could effect the minimum headway, coverage of stops and possibly imply curtailing citylines or clustering of existing tram and busroutes from outside into the city centre. The urban network is analyzed in order to prepare a considerable adaptation of the urban network. 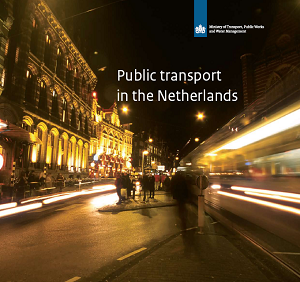 The Dutch Cabinet has forced on the City region a mandatory tendering of the urban transport by 2013. Regional Executives therefore have chosen to start preparations for a tender of the integrated system of multimodal services for bus, tram and metro (including the maintenance of the railinfrastructure, depots and workshops). Stadsregio Amsterdam has introduced competition by tendering transport services under Dutch law in 2004. A difference in approach is taken as services covering suburban areas (Waterland, Zaanstreek, Amstelland-Meerlanden) has been subject of multiple tendering. Whereas for the public transport in the main city tendering was postponed until 2012. In the Spring of 2010 an amendment to the Transport Act was brought to Parliament in which the three metropolitan regions were offered a choice between a tender and direct award. 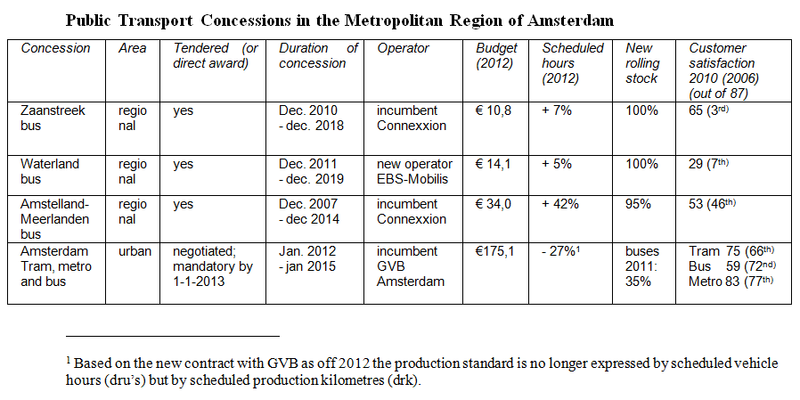 With the reasonable expectation that this bill would be adopted in time, the Executive Board of the City Region decided on August 26, 2010 to a private award of the concession of Amsterdam to incumbent GVB. In addition, the Executive Board examined the market conformity of GVB and made legal adjustments to the control of the company in order to meet the requirements of the PSO-Regulation and the Dutch Transport Act. Nevertheless the coalition agreement of the new liberal government in September 2010 specifies that the contract obligation remains in effect for urban transport. In February 2011, the Ministry of Transport revoked the option in the Act accordingly. On February 1, 2011 the Minister responded negatively to the request of the Executive Board for a further delay of the obligation to tender until January 2018. With not more than one year respite period from the obligation to tender (until January 1, 2013) now a comprehensive multimodal tender for the Amsterdam urban transport is being prepared. The Minister has once again refused to grant Stadsregio any further delay. By October 31, 2011 the Board of Executives has reported the Minister what actions have been undertaken to meet the deadline for an invitation to tender. The results of the three regional concessions being awarded after an invitation to tender where also very encouraging, showing that competition is indeed an effective measure to enhance efficiency and achieve a significant increase in supply of services and the quality offered at no extra costs. 2. Sustainability: reducing environmental impact of public transport. Buses of the operators in all regions that are contracted with Stadsregio Amsterdam are already equipped with particulate sootfilters. The overall impact of emissions by diesel buses will be severely minimized not only on a global scale, but also in terms of local profit for limitation of PM10. Although direct prescription to operators for energy and fuel choice has not been made, Stadsregio Amsterdam required that all operators fulfill the Euro-V emission standard in 2011. Non-motorized modes are enhanced, notably the completion of the bicycle network, with substantial investment in new parking facilities, rental arrangements at transfer nodes and new dedicated lanes. The introduction of a national road pricing scheme for private car users is formally abandoned by the new liberal-conservative government in its coalition agreement of October 2010. Effort is directed towards a taxation of energy inefficiency and levy’s for less sustainable cars, but no mileage charge. A shift from fixed costs to variable costs is possible by increasing excise taxes on fuels and at the same time proportionate reduction in fixed costs. An extra € 500 million is promised to be invested in more road and railwaycapacity, and an extra effort of the public transport is demanded. The government works with the industry to foster measures to combat congestion and extend travel facilities such as parking, transferia, carpooling, bicycle facilities, incident management and the intensification of teleworking. The government is investing in roads and inland waterways to relieve environmental pressure of growing traffic. 4. Communication, safety and security. Although there are no certified strategies to influence attitudes towards public transport, Stadsregio Amsterdam supports the 16 municipalities as partners of the transport authority in carrying out the communication with their citizens in the Metropolitan Region of Amsterdam. The operators on their part are encouraged to develop an outreaching attitude towards potential customer through image campaign and marketing activities. Stadsregio Amsterdam has an active policy on safety and security relying on a cooperation with the City, the operators, and Amsterdam Metropolitan police. A mobile task force is dedicated by the police and specific efforts are required from operators about information, services and safety in transport hubs such as Amsterdam central station. Also camera- surveillance is used and extended to buses. 5. Regional mobility and transport policy plan . A new strategy by the minister of transport is adopted to enhance the better and more efficient use of infrastructure networks, with regard to the cutbacks for public transport projects and operations. This also applies to traffic and road investments, where a better and smarter usage and control of the present infrastructure seems more and more imperative. The plan draws strategies in order to direct and prioritize effective choices in investment policy to keep Amsterdam central city properly accessible. Traffic management on a coordinated regional and local scale will make a large contribution to support the maximum profit of facilities available. To guarantee viability and uphold an acceptable level of accessibility regions realise authorities have to cooperate and make smarter use of ICT and open sources of information, inviting market initiatives to deliver applicable solutions. 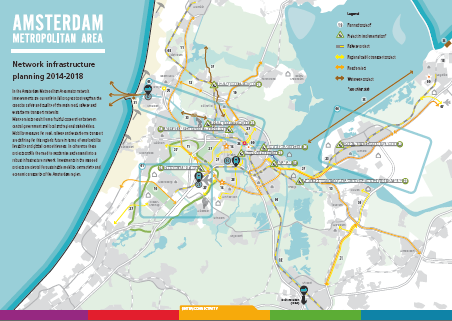 The development of infrastructure for the longer term (2020-2030) foresees the underground connection linking the North of Amsterdam to the South via the city center. A range of 14 railway projects, consisting of 8 new railway stations in the Amsterdam metropolitan area, tailtracks, track switches and partially new track will be completed by the end of 2013. Important progress is made in taking steps to resolve problems on the corridor connecting the new gained land of Flevoland in the corridor Almere-Amsterdam. The urgency to create added track capacity on the railcorridor to Almere is immanent. By the end of 2013 a new track for rail connection from the Amsterdam region to the North and North-east of the country will be ready for operations. This “Hanzelijn” will connect the northern provinces (Groningen and Friesland) in a faster way to the Randstad area, mainly to Schiphol Airport, Amsterdam and Almere, the latter representing the fastest growing conurbation in the country, east of Amsterdam metropolitan region. In 2011 further steps have been made to prepare the deployment the eastbound extension of the Zuidtangent BRT. This extension will offer a second link by public transport for the disclosure of the housing area on the newly created peninsular “IJburg” built in the Y-lake east of Amsterdam. This should result in a fully completed new link for the High Level of Service-buses from IJburg to the existing national road network South East of Amsterdam by the end of 2015.